Perhaps you started out with the idea, or maybe your character just happened to work out that way after you got started, but there are times when you have a character that others just can’t stand. Maybe it’s their attitude or their actions that alienate other characters, but for whatever reason, real or imagined, they just aren’t that likeable. Not necessarily, if you play it right. 1.The character we love to hate: Ever watched a show or a movie with a character that seems to have absolutely no redeeming qualities at all? And yet as you watch you really can’t dismiss them and even like them for it for these qualities? It’s usually because these characters have a certain charm and influence. Sure, they might be sociopathic, but they tap into basic psychology of suggestion and win over their audience without us sad souls knowing better. If they can’t pretend to fit into the world around them, then they won’t and the spell will be broken. 2.The disagreeable social misfit: Maybe it’s a psychological condition, or maybe they missed out on all those early social learning opportunities as kids, but these often angry and broody characters take socially awkward to a new level, often earning curse words thrown their way. These, in my own experience, are the real fun ones to play, because they are ultimately redeemable in some way and their disruptive state is usually a deep part of their backstory. There are usually reasons for everything your character does, and getting to reveal these reasons through the character’s interactions with others are some of the real joys of RPing. Some really great moments can come from this. Whether this character always stays antagonistic or ends up evolving depends on you and their circumstance. But guaranteed, if you play this one right, it’s going to be a lot of fun! 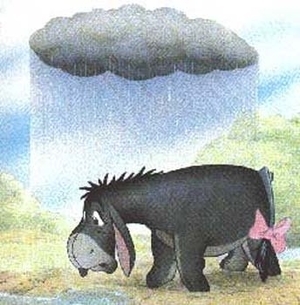 3.The Eeyore: For every optimistic and cheery character there is a pessimist to balance things out. Not everything is sunshine and roses after all, and good RP recognizes this need to balance. So don’t be afraid to have a grumbling character to annoy the heck out of all the happy go lucky characters. After all, conflict is great for character development! A word of caution though: this can get monotonous and boring, so know when to back off and when to push. Regardless of the style of un-likeable character you play, there are so many ways to have fun with it! Understanding a bit about social dynamics can make things even more intriguing, but even if your character is simply a jerk, know there there is a place for them in any RP. You’ve just got to play it right. –Lindsay Bayes is a writer and avid RPer over at Star-fleet.com, the oldest bulletin board Star Trek RPG on the net. She stumbled upon it three years ago and never looked back. Among her many characters, Faye Calloway is one who most can’t stand but is ultimately redeemable and a heck of a lot of fun to write!